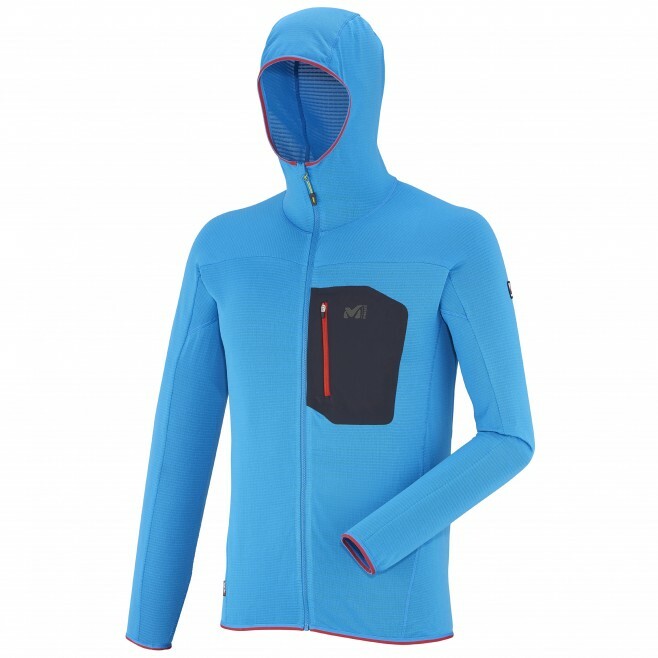 "The Light Hoodie jacket is designed for the keen mountaineer and built to bring warmth in fast alpine ascents, delivering a perfect balance of breathability and lightweight.The Polartec� Power Dry� Gr id High Efficiency is design to keep you dry, even when you sweat. Manufactured using an exclusive double-sided knitting process, it combines a moisture-wicking inner surface and a quick drying outer surface. It features POLYGIENE� anti-odour technology (BLUESIGN� certified) to restrict bacterial development. Ideal for committed activities with a polyamide outer ensuring extreme durability and a bonded acrylic coating for guaranteed windproof protection and breathability. Its minimalistic design keeps weight to a minimum. A quick access chest pocket allows to stow small items and raglan sleeves enhance mobility and durability at high wear areas by reducing abrasion points. A minimal elastic binding construction at bottom hem, wrists and around the hood opening cinches naturally and securely, without restricting movement. The Alpine Fit� reduces bulk around the body and gives enough room for unrestricted movement. With a balaclava hood that moves with the head, increasing freedom and peripheral visibility, the Light Hoodie is ideal to wear as an underlayer to complement a protective shell. Trilogy gets its name from the challenge �ric Escoffier and Christophe Profit, mountaineers from the MILLET team, had set: A solo peak bagging winter ramble of the three North faces (Eiger, Cervin, Jorasses).In the field of mountaineering equipment, Trilogy is the quintessence of alpine performance. This summer, the Trilogy series delivers high performance with streamlined designs and one goal in mind: light weight and energy efficiency.This jacket is also rated as a Low Impact� and Bluesign� product, which means any harmful substances is eliminated right from the beginning of the manufacturing process of the component(s) and standards for an environmentally friendly and safe production are set and controlled.